Good grief! Just when I think I’m finally growing a little more like Christ, my tongue trips me up yet once again! In our marriages and in our friendships, what comes out of our mouths often tends to gravitate toward criticism, complaints, sarcasm, etc. Try as I might, I just can’t seem to turn the corner on this problem! How about you? Chances are good that your tongue also gets you into trouble. That’s because we have a common enemy. Satan keeps subtly luring us to spew negative, hateful, disrespectful, angry words. Thank goodness, there is One who has the power to tame our tongues! Jesus is stronger than the enemy. 1 John 4:4 says “greater is He who is in you than he who is in the world.” Hallelujah! 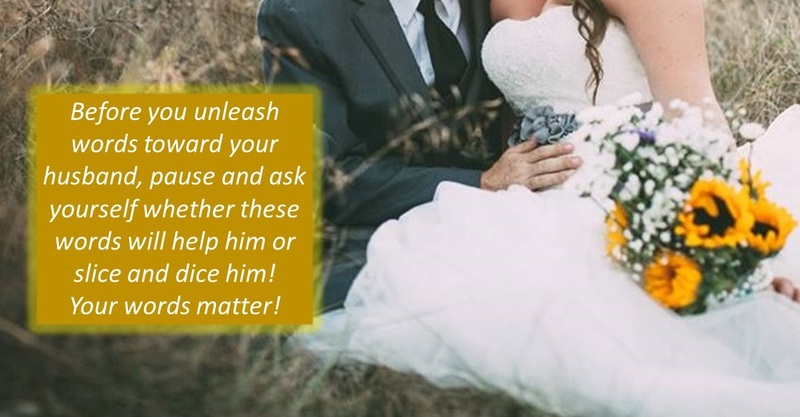 Will you join me in praying for God to help us catch ourselves the minute we’re about to say something disrespectful, sarcastic, negative, critical, or arrogant toward our husbands? ← Are you spiritually intimidating your husband? I woul love nothing better than praying with u by ur side ,u angel of God.